If you are planning a trip to Spain you will definitely want to take a side trip to Toledo. Toledo is about 40 miles away from the capital of Spain. If you take the high speed train from Madrid, you can get there in 30 minutes. At one time, Toledo was the capital of Spain and it still has many of the qualities that characterize many European capitals. This charming city, surrounded by the Tagus River, offers much in the way of historical landmarks and cultural experiences making it a popular site for tourism. During the 13th and 14th centuries, Toledo was a mix of many cultures, including Christians, Jews and Moors and there are remnants still today which show the toleration of the different religions during that period. Many ancient churches, synagogues and mosques that date back to that time are still standing. The Puerta Bisagra is the main entrance to the old city of Toledo and is a magnificent gate built by the Moors during the 6th and 7th centuries. It is easy to find enough things to see in Toledo to spend a few days there, but if you only have one day, there are a few things to choose from that are must-see attractions. The Alcazar of Toledo is a stone castle once used as a Roman palace. Later, during the Spanish Civil War it became a symbol for Spanish Nationalists because of events that transpired there. This castle is now a war museum like none you’ve ever seen, with fascinating exhibits such as Cortez’s flag and letters written by Napoleon. Three significant religious sites are the Cathedral of Saint Mary of Toledo, which is considered to be the epitome of the Gothic style in Spain; the Synagogue of El Transito, the oldest and most ornate synagogue in Toledo, now a museum of Jewish history; and the Mosque of Christ of the Light–in Moorish days known as Bab-al-Mardum, the only mosque that is still standing but has been converted to a Catholic church. Located in Toledo’s Jewish quarter is the Museum El Greco, which contains many works by the exceptional painter of the same name, as well as other 17th century Spanish paintings. Furniture and ceramics from this time period are also on display. If you plan to do some shopping, Toledo has a variety of souvenir shops. The most popular items are conquistador swords, glazed hand-painted ceramics and damascene, gold and black enamel work used to make small decorative plates and beautiful jewelry. 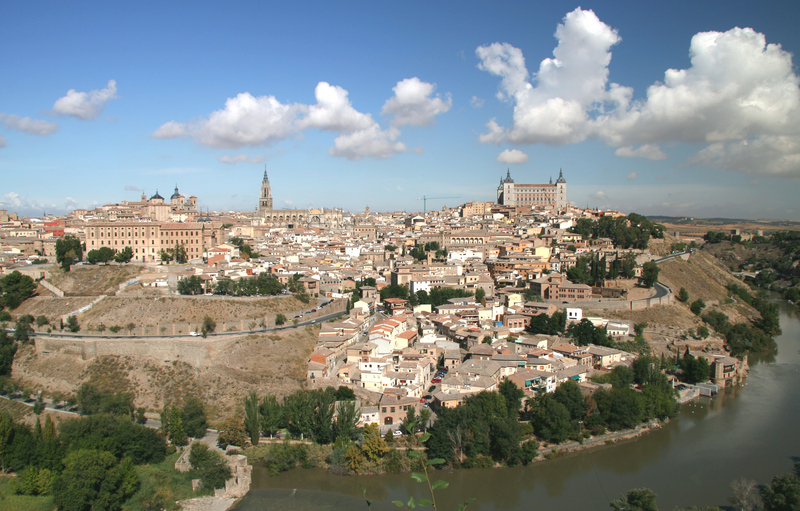 If you are planning a trip to Madrid, be sure to set aside a day or two to see the beautiful city of Toledo. Whether admiring the fascinating architecture, enjoying the religious history and culture, or shopping for souvenirs, it will be an experience you won’t soon forget!